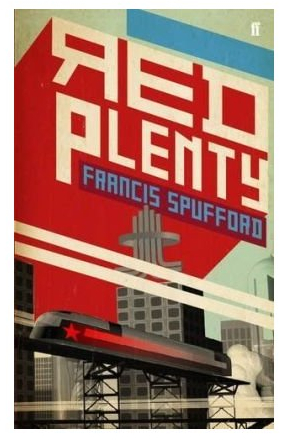 Francis Spufford’s Red Plenty is superb. Spufford has produced a book which, combining real characters and events with some of the authors imaginings of what people may have thought or felt, attempts to describe and analyse the Soviet experiment at a time when people in the USSR still hoped for the future and people in the west still feared that the Soviet Union would outstrip them. Largely he succeeds. This is because the book is extremely well written, with a good novelists eye for language, but also because it’s meticulously researched (well, as far as he felt able, he apologises for some of the limits to his research). There are many things that strike me about Red Plenty. The first of these is the way that Spufford handles his subject. Naturally, we know that the Soviet experiment only lasted from 1917 to 1991. From that point of view, one can glibly say that it failed. If you are so inclined, you may choose to use this as damning evidence against any form of socialism. However, this book would not work if it were written with a knowing, smug tone. The End of History type triumphalism which followed the decline and break up of the Soviet empire was a regrettable thing to happen as it led to many in power in the west losing any the ability to examine their own actions and motivations. It destroyed any self-doubt that they may have had. A dangerous thing at any time, I think. What Spufford successfully does is to create a serious “what-if?” Of course, he also highlights some of the absurdities that there were in the system, and I think I should make it clear that he is no apologist for Stalinist terror, or the less total, but on occasion equally as deadly, oppression that existed throughout Khrushchev’s time in office. His point is simply that speaking in terms of winners and losers is simplistic, foolish and patronising. Yes, it may be the case that through the latter half of the twentieth century, the western economic model was in the ascendant, with the USA its ultimate expression, but that’s not to say that this will continue to be the case (and it’s possible to point to many cracks in it now). As the book is neither strictly a novel nor a history book, Spufford uses both real people from this period of history and creates some to fill some of the less well-documented positions. This device adds interest to the story, as he can explore the characters motivations and how they interacted with the system with out being constrained by reality. It’s not essential that you are completely familiar with the period and it’s players; there is a cast list at the start, which tells you who is real and who he has invented. By breaking the book up into snapshots, involving small groups of characters here and there, Spufford skilfully manages to describe the period, without having to resort to a dense book. Not to say that this is inherently bad, but this book gives something different than a fat history of the period would. I suspect (though I could be wrong) that where we know a lot about a historical person, and their views on life (say, Khrushchev) it was easy for him to view the events through their eyes. Where he wanted to cover something which involved people of lesser historical stature (and give the human interest by viewing the situation through their eyes) he’s, invented characters. Part of this is, of course, there’s probably less documentary evidence to support how a specific person thought. But it does help carry the history-as-a-novel thing. It prevents the work from becoming dry. You’d think that this would make the book at the least dry and at the worst, dull. But actually, the easy tone and human interest in the novel (rioters, young couples attempting to make their way and start their own families) means that while the book undoubtedly has heft, it is cushioned. At the start of each section of the book, Spufford links his own writing to that of traditional Russian stories; the “skazki” which, according to Spufford, unlike Western fairy tales, which “begin by shifting us to another time.” The “Russian skazki make an adjustment of place.” (Three pages in and already I was learning something!) These places were recognisably like Russia, except that the life was less brutalised, people lived with plenty. They weren’t oppressed. The argument here is that as the skazki died out, they were coming true; names for the new products of industrialism often came from these stories. People were led, wanted, to believe that the utopia that Marxist-Leninism was on its way. The balances were kept in a long, library-like room lined with filing cabinets, watched over by a librarian-like gorgon at a central desk. As I’ve indicated earlier, this informs the tone of the book. Although I knew that ultimately the USSR, for many reasons, was doomed to fail suffering a slow decline after the heady years of growth, Spufford works hard to convince me that for a brief time some people really believed that they were going to create a paradise. He doesn’t shy from exposing some of the crimes committed by the state in this period and, further, he flags some of the absurdities of the system that people were trying to create. Whether this be through denouncing legitimate branches of science as bourgeois, because they didn’t work politically (notably, Lysenko) or the situation whereby it was acceptable to deprive the population of essential goods, because as end consumers, them not getting a new sweater didn’t inconvenience anyone else. This book is excellent if your familiar with the period and helps to bring it to life. If you aren’t however, it’s still good at causing you to question some of the assumptions that we now make about government and society. I’m not suggesting that the I’d want to live in the USSR in the 1950s and 1960s, but it reminds one that economic and political systems which at one time seemed permanent, can crumble very quickly. This entry was posted in Review and tagged england, francis spufford, history. Bookmark the permalink.